The Appraisal Institute and the Georgia Real Estate Appraisers Board (GREAB) have approved 7 hours (3 hours morning and 4 hours afternoon) of continuing education credit. 100% of classroom time is required to receive continuing education credit. The Georgia Real Estate Appraisers Board does not permit partial credit. 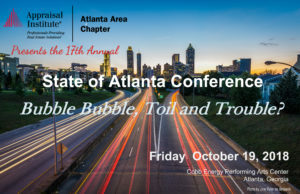 One (1) hour of extra Appraisal Institute CE credit is approved for attendance at both the State of Atlanta Conference and Chapter Lunch Meeting.